This year, I finished my tax returns on April 14. And I promised myself I would never put myself in a similar situation again, where I’m computing my taxes at the last minute. 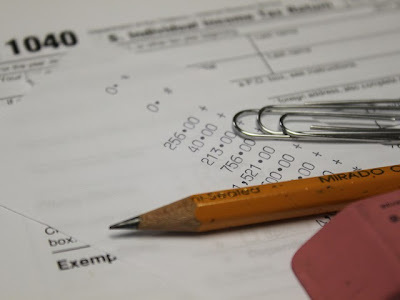 While I was organized at a basic level — all my receipts were gathered in one place — I was behind in entering my business expenses into QuickBooks, in scanning my receipts, and in completing some other administrative tasks necessary before my taxes could be done. 1. Sometimes I forgot what I had bought. While I’m generally very good about annotating my receipts if it’s not clear what I purchased, once in a while I neglected to do that. 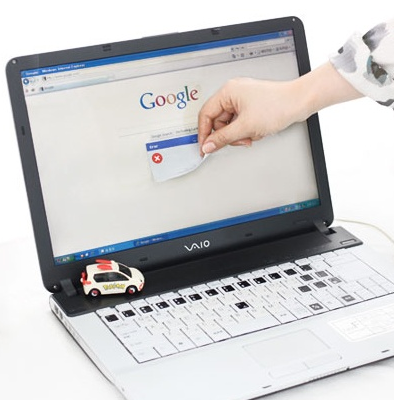 If I’d entered the expenses into QuickBooks right away, the purchases would have been fresh in my mind. But when I had to deal with receipts that were months old, things were more difficult. I wasted time over this, and probably missed a few minor deductions. 2. I lost control of my time. In the week before my taxes were due, I had to turn down invitations I would have liked to accept, because I had no free time. 3. I caused myself undue stress. I knew I had just enough time to finish everything, but that meant I had very little slack time to recover if things went wrong. My area had some strong winds that week when I was working on my taxes; people living nearby lost their power. If I’d lost mine, it would have made completing my taxes on time very rough. Any kind of organizing maintenance is so much easier if it’s done on a regular basis. After I completed my taxes, I vowed to myself that I would keep my records up-to-date in the future. I started writing this post in late April, and set it aside — because I wanted to make sure I did indeed follow through on my good intentions. Now it's the end of July, and I'm glad to say I've been doing pretty good. I don't have my mileage entered into QuickBooks yet, but everything else is in good shape. Doing my taxes next year should be a breeze. Are you a sticky note addict — and looking for something beyond the wide range of Post-it products? 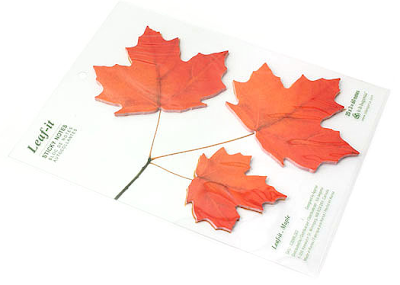 Let's look at some of the options, including the Leaf-It series from Appree, in Korea. You can find these at JetPens.com, MochiThings, or Stationery Art. 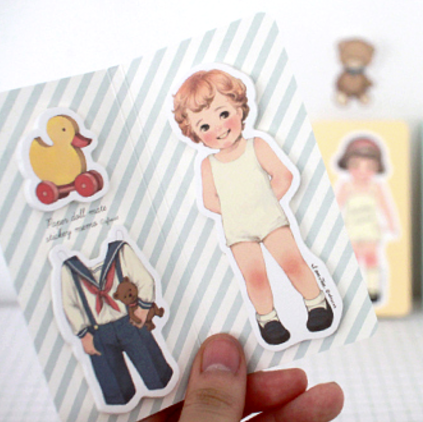 And there's one more I want to show you from Korea: the paper doll sticky notes. These are out of stock at many sites which once carried all four versions, but you can still get Tom at Ginko Papers and The Kawaii Notebook, and Julie at cutetape.com. Staying in Asia for a moment, let's look at the sticky notes from Twelvetone, which include pigeons and cats. You can find these at Two Owls, Cool Stuff Express, and Mimoto. 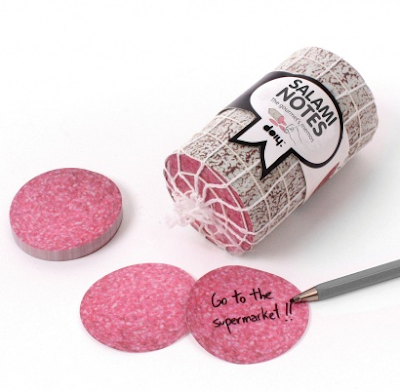 Now we'll change continents, and jump over to Doiy in Barcelona, Spain, for these salami sticky notes. You can also buy them at PIQ, design3000.com, Fireworks Gallery and Propaganda. 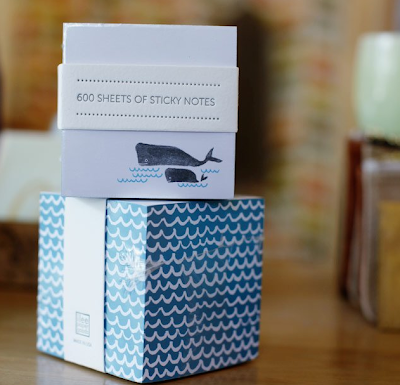 Over in Germany, the teNeues Publishing Group has a number of intriguing sticky note sets. 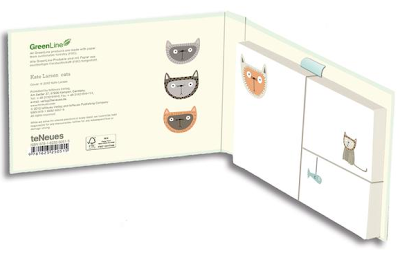 All the paper comes from sustainable forestry. 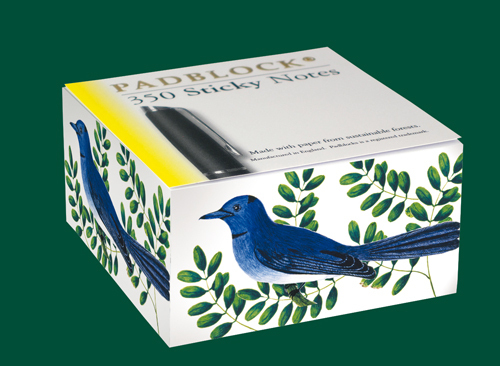 And moving over to the U.K., we get the Padblocks sticky note pads, in 38 different patterns. Finally, let's cross the ocean and come to the U.S. — where you'll find Swanky Press and its various sticky note cubes, all of which can be personalized. And let's conclude our tour with this delightful sticky note block from Ilee Papergoods, sold by Room6. Sometimes the easiest jewelry organizer to use is one that hangs in your closet, from the rod, along with your clothes. Let's look at some of the options for this kind of storage. Umbra has taken the basic pocketed jewelry organizer and given it a fun twist. 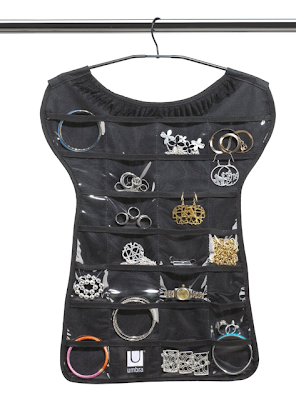 The company first came out with the little black dress jewelry organizer, which is still available — but now you can also get the little red dress, the little black tee, and more. The reverse side has hook-and-loop tabs instead of pockets; these can work better for things like necklaces. 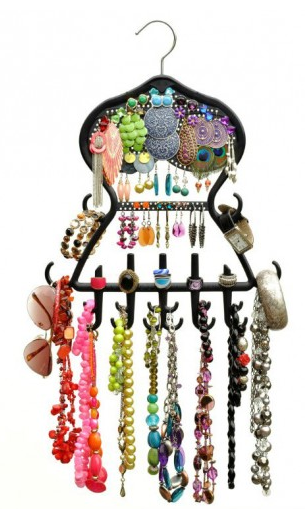 You can also get hanging jewelry organizers in various patterns from The Macbeth Collection. 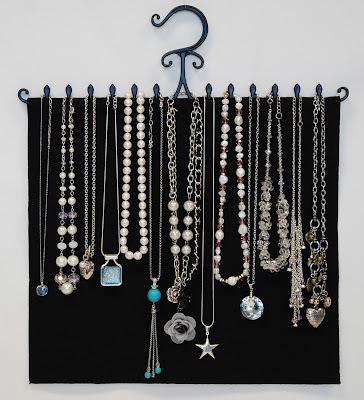 Another hanging jewelry organizer, which accommodates necklaces, bracelets, earrings and rings, is the Roxsee Jewelry Hanger from Untangle My Chains. You can get it in black or pink. And here's an eyelet jewelry hanger — another option that seems best suited for necklaces. It's available in three colors: yellow, green and purple. 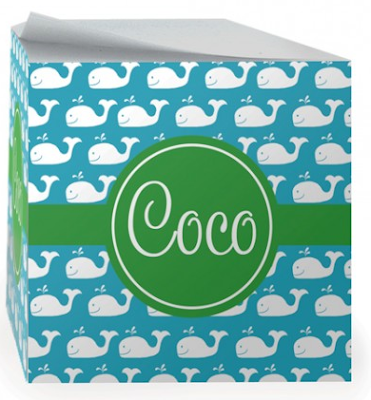 Update on Sept. 15, 2014: This product is no longer available. Finally, if you've got the skills and the time to do so, you could make your own pocketed hanging jewelry holder, getting exactly the fabric and pocket sizes you want; that's what Ashley at Make It & Love It did. 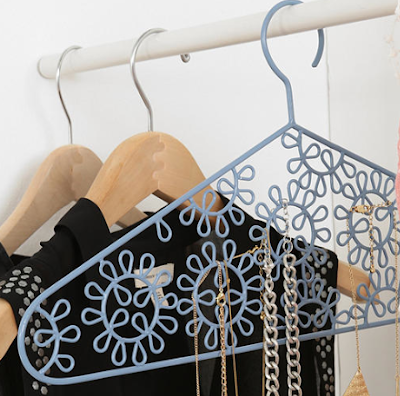 Or, in another DIY option, you could take wooden coat hangers, add some hooks and/or eyelet screws, and create a jewelry hanger that way — as Ann Marie on Household6Diva did. Yesterday, I had surgery to remove a growth on my right vocal cord. This is a minor surgery — I was in and out the same day — but it's still surgery, with general anesthesia. Here's how I got prepared, based (in part) on the clear post-surgery instructions I received. 1. I arranged to have someone drive me to surgery, take me home — and then stay with me overnight, just in the highly unlikely case that something went wrong. Fortunately, I've got a great neighbor who could do that for me; other people offered to help, too. But when the hospital wanted to schedule the surgery for July 5, I had to ask for another date, since that's the one time she wasn't available. And having someone stay overnight gets you to do the same thing that having any other company does: You take care of all those little around-the-house cleaning and tidying tasks you've procrastinated about. 3. I'd installed 1Password on my MacBook a few weeks ago, largely to make it easier on my brother (or whoever has to deal with my computer and online life) if anything happens to me. Now that person only needs two passwords: the password to my computer, and the one to 1Password. However, I hadn't yet entered any data into 1Password — so having the surgery was a good trigger to do that. 4. I paid any bills that were upcoming in the near term — again, a just-in-case kind of thing. 6. Since I'm supposed to talk as little as possible in the week after surgery, I cleared my calendar of any appointments that would require talking: clients, doctor appointments, etc. Fortunately, I've got the Internet and I can still type! My brother will call my dad to relay the "she's fine" message, since my dad isn't an email kind of guy. 7. Of course, I stocked up on the types of foods recommended to me: popsicles, ice cream, applesauce, cottage cheese, etc. 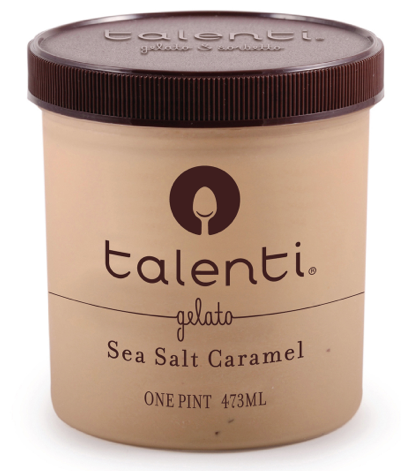 My neighbor enjoyed sharing some Talenti Gelato with me last night! 8. And I had my prescription pain pills on hand, just in case I needed them! All seems to have gone extremely well — but I'm glad I was prepared in case anything went wrong, too. 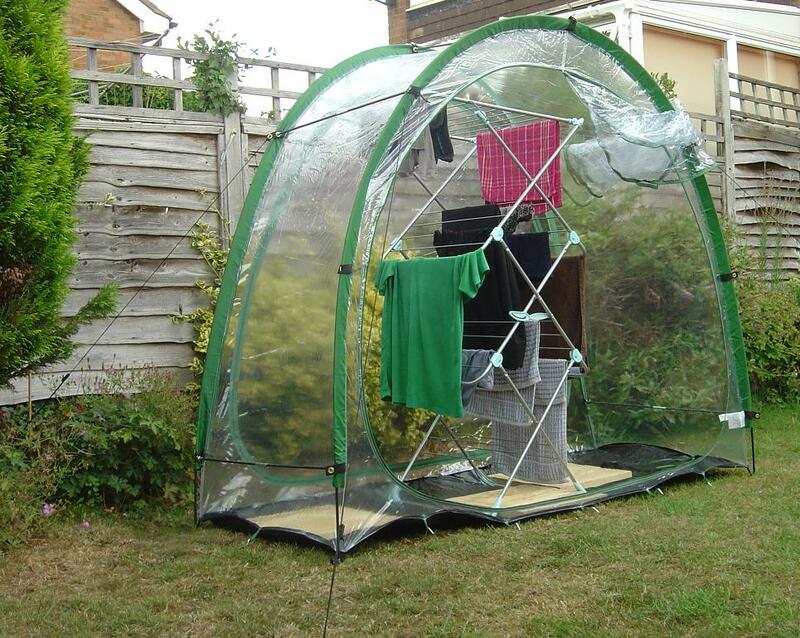 Are you like me — someone who does a lot of line-drying of the laundry? 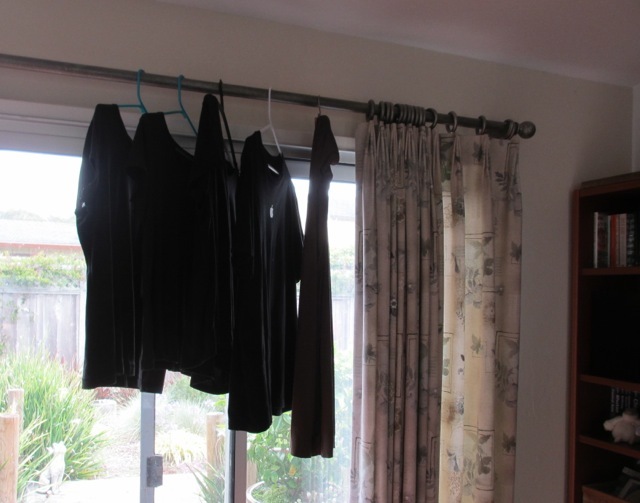 Some of the clothes I prefer to line dry (after a quick spin in the dryer) get hung up on a curtain rod; smaller items get hung in the bathroom, on the shower door. If you'd prefer a somewhat nicer looking alternative, I've got plenty of interesting options to show you — beyond those I found back in January 2011. 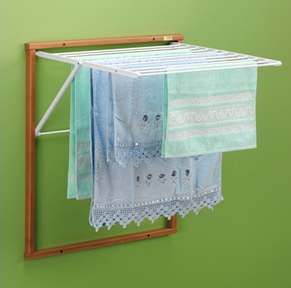 This clothes drying rack from Artweger is small enough to fit in many bathtubs, or on a balcony. Artweger has sales outlets in many countries — two places to buy this rack are here and here — but, sadly, not the U.S. The company makes a larger version, too, for those with more space. 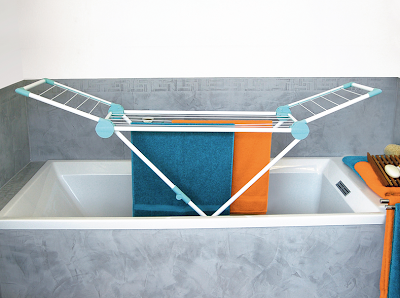 This 8-arm drying rack can hold heavy wet towels and blankets, the vendor says. 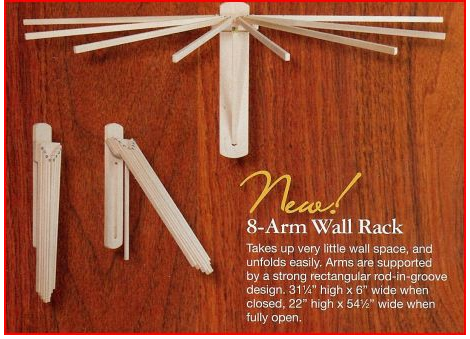 The 8-arm rack sold by Lehman's might well be the same thing. 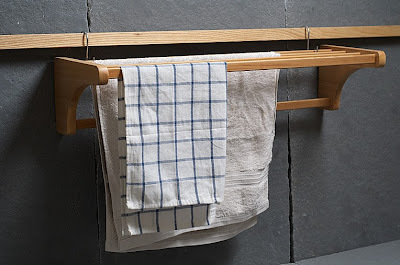 Another lovely version of the same type of product comes from Black Country Metalworks Ltd.
Another nice wall-mounted drying rack comes from Arredamenti Italia. I found it for sale here and here — but no place outside of Europe. If you happen to have a radiator, this radiator rack from deVOL might interest you. 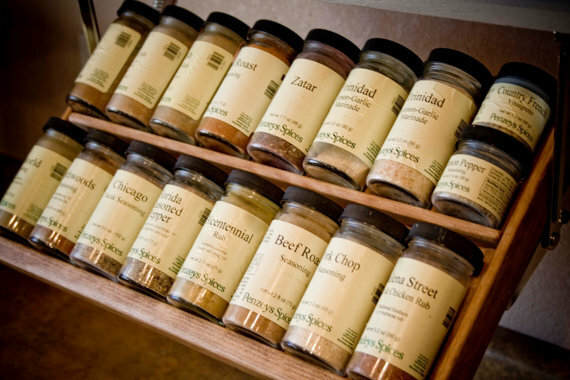 Anyone with a spice collection is likely to struggle with the storage question. Here's a list of all the ways I've found to store the spices; hopefully, one or more of them will work for you. This is the solution I wrote about a few days ago. 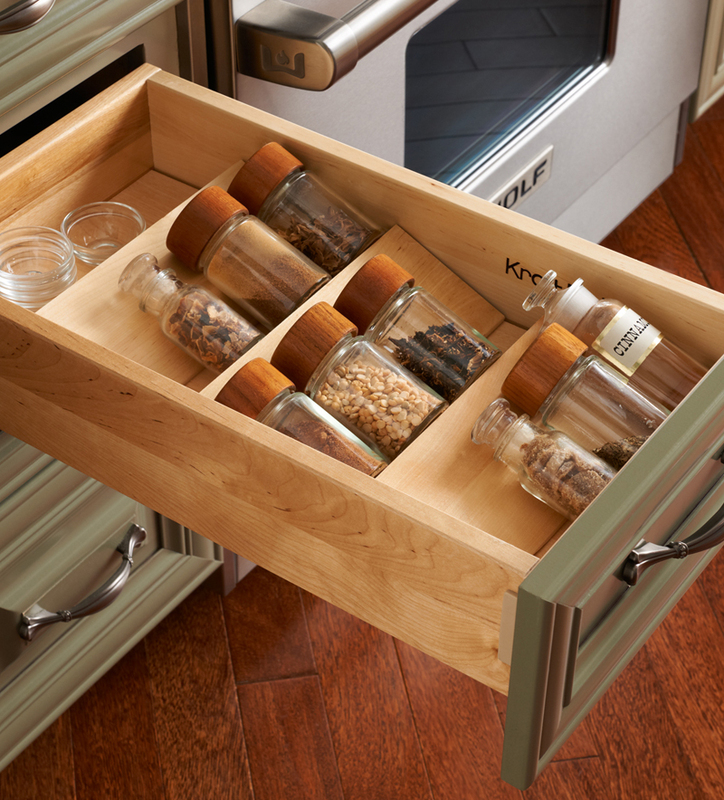 KraftMaid, Rev-A-Shelf, Omega National Products, Häfele, Hoffco, Eagle Woodworking and Custom Inserts all make spice drawer inserts. 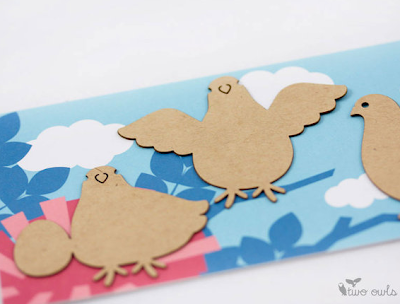 You can find them in wood or plastic, in various sizes. 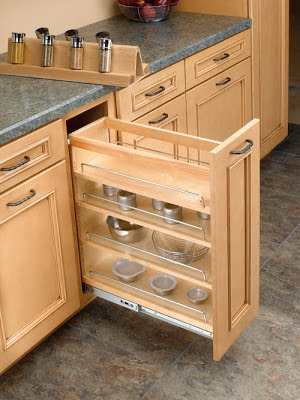 Some can be trimmed to fit, and some can be made specifically for your drawer's dimensions. The one shown above comes from KraftMaid. Some of the ones I see make me nervous; I'm not sure they'd hold the bottles well over time. But some look very sturdy, like the one from Hoffco, shown above. KraftMaid, Rev-A-Shelf and Häfele provide other options. These are three of Omega National's Select Spice Susans, which you can buy from KitchenSource.com and other sites. I like the nice lip on these — but, of course, there are many other lazy Susans you could choose from. 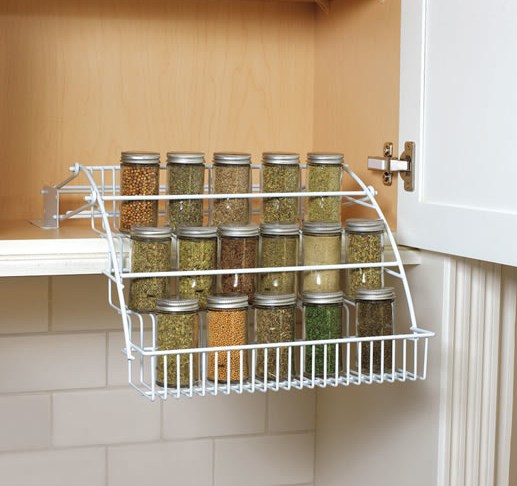 This spice rack reminds me of the undershelf baskets at The Container Store — same idea, except it's a product designed specifically for spices. It's made by Kamenstein and sold at Hayneedle. 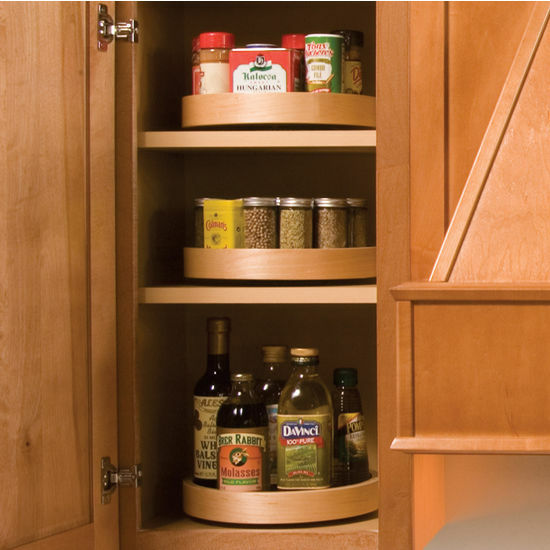 GreatRack makes this nice-looking under-cabinet spice rack, available in maple and cherry. There's also one from Axis International. Rev-A-Shelf has a spice rack insert for its base cabinet pullout organizer. 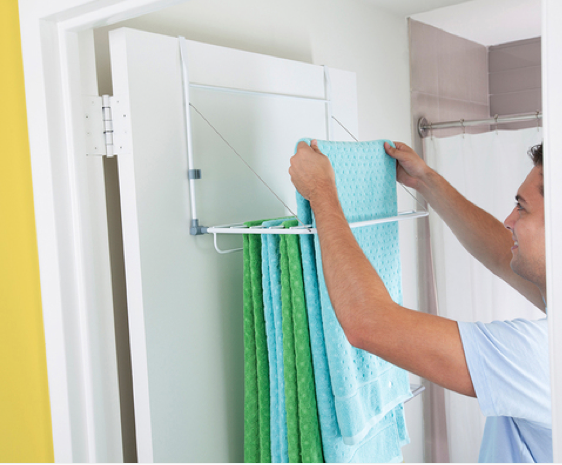 I encourage you to simply attach two metal strips to the inside of your pantry door or a kitchen cabinet door. 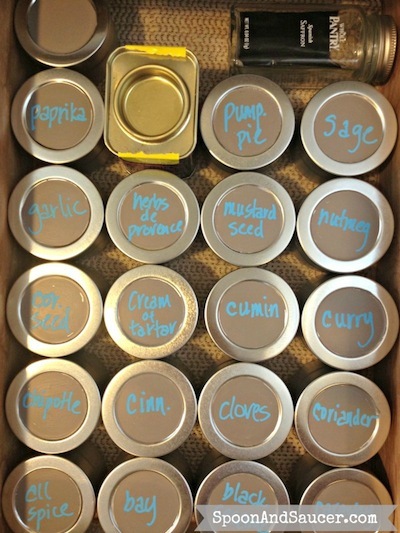 Then, as you purchase good spices from a gourmet grocer or an online store like Penzeys Spices, just stick adhesive magnet tape to the back of the tins so they’ll stick to the strip. Detailed instructions can be found on Instructables. Almost two years ago (I think) I re-organized my spice cabinet. There were small containers, magnets, and squares of metal attached to the cabinet doors. It looked glorious. Until they started to fall off the door, spilling all over the counter. If you want to give it a try, you don't have to be as do-it-yourself as Erin was. It's easy to find magnetized containers, from Ikea and other sources, which can be mounted in all sorts of creative ways. Or you can buy ready-made products, with containers and a magnetic board for mounting them, like the ones from Soho Spices. 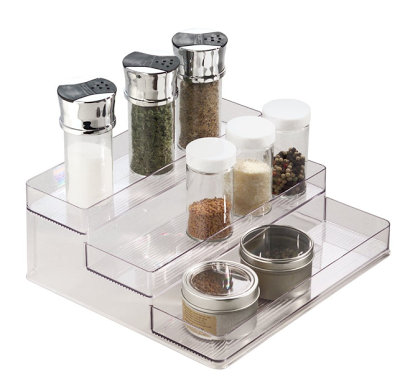 The Tubular Spice Company has a selection of wall-mounted spice racks; the one shown fits six standard jars per tier. 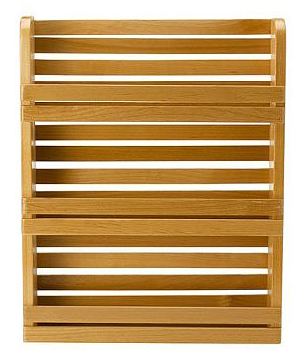 It looks very much like the rack from Out of the Woods of Oregon, but I don't know for sure if it's the same product. If you have a kitchen rail system, it might have a spice rack option. There are two unique products here. One is the SpiceStack, which I've mentioned before. 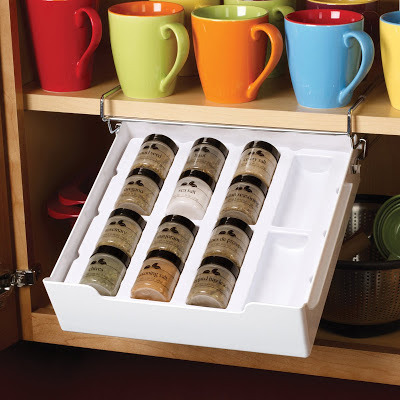 The other is the Rubbermaid Pull Down Spice Rack, shown above. 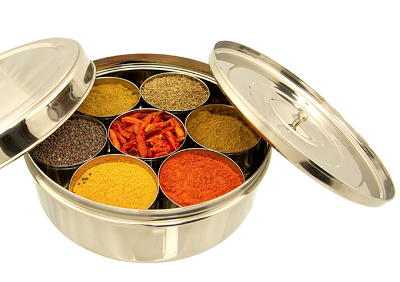 The masala dabba is a traditional Indian spice box, and you can find one online fairly easily. The Spice Tiffin is a slight variation. I've mentioned the Prodyne spice tower before; you can now get it with a carousel. 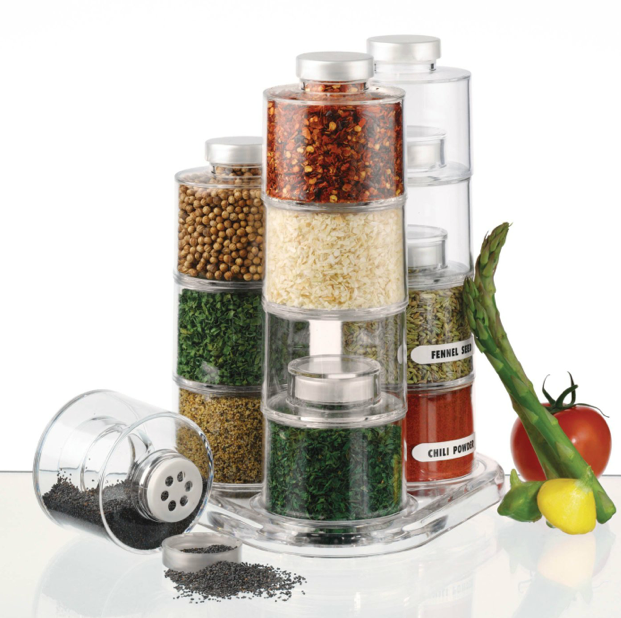 The RSVP Endurance Stainless Stackable Spice Jars would be another stackable option. My quibble with some tiered spice racks, which usually go inside cabinets, is that it seems hard to get to the spices in the rear — and too easy to topple those in the front. But there are many variations, and you may find one that works well for you. This one, with a lip on each step, avoids that potential toppling problem. Jen Hofmann made her own version of this style of spice organizer for her own cabinet, and her version looks easier to use than many others I've seen. This was an idea from Apartment Therapy — a bit quirky, but maybe useful to someone. Did I miss anything? What works for you? 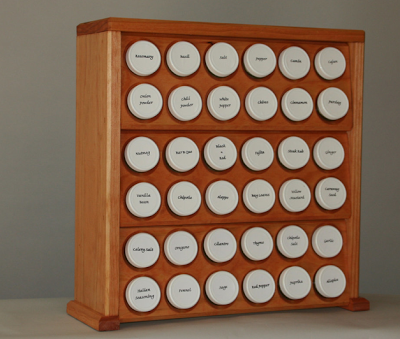 If you've got a drawer you can dedicate to spices, that can be a wonderful way to store them. The photo above, used with permission, shows you how Brandie Kajino created her own spice drawer; you can read all the details on her delightful blog, Spoon And Saucer. Since Brandie had some problems with a prior magnetic system, she likes using the drawer because the containers "can't FALL from the drawer." 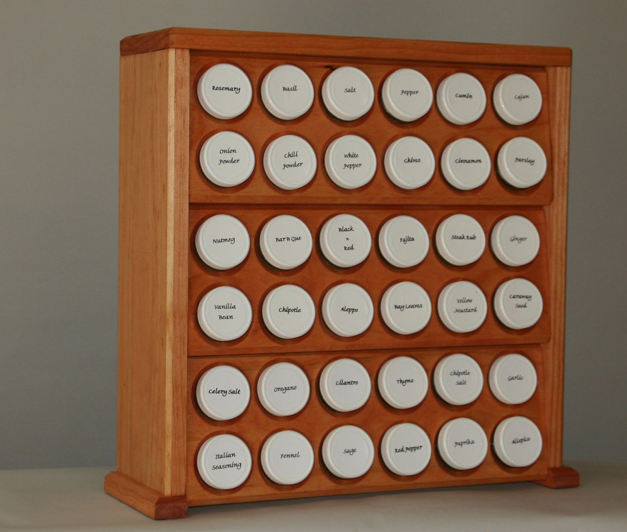 And Brandie's not alone in her fondness for this approach; let me point you to some other sites which show lovely spice drawers. 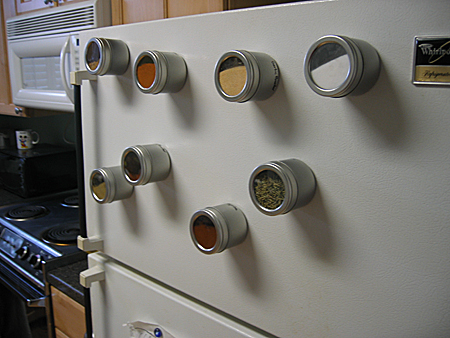 Kavita had jars left over from an old magnetic system, and used them in her spice drawer. Unlike most other people using this approach, she didn't label the tops of the containers — but the lids are transparent. She says: "I like being able to just pick out spices by looking at them, but in case I forget which is which, I've written the name on the side!" Unsophisticook used old baby food jars in her spice drawer, as did Kaylan. 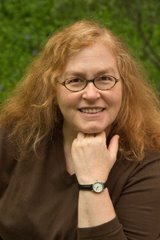 Jill MacCorkle went with "food-grade metal tins with clear tops." She says her drawer makes her feel "all organized and Martha-like" but "mostly it makes cooking easier and more fun." And Jaime used 4-oz mason jars. She also lined the drawer with polka dot wrapping paper, which gives it quite a festive look. Of course, there are many other ways to store the spices, too. More on that in an upcoming post. Storage ottomans are pretty easy to find. But really eye-catching choices? Not as easy. But there are certainly some lovely ones to be found, including the one above: the Frank Lloyd Wright Taliesin Storage Ottoman from Copeland Furniture. It's also sold at Inmod and the Frank Lloyd Wright Foundation. 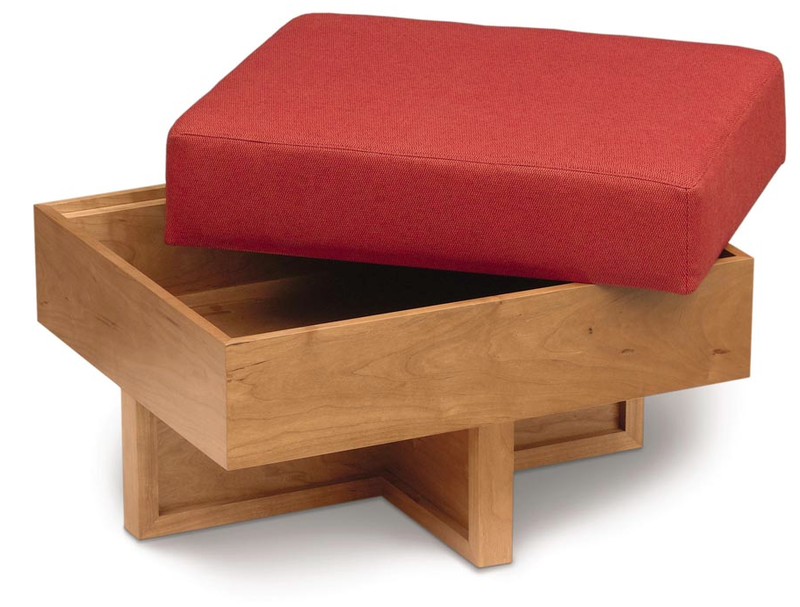 Copeland also makes the Frank Lloyd Wright Usonian Storage Box Ottoman. 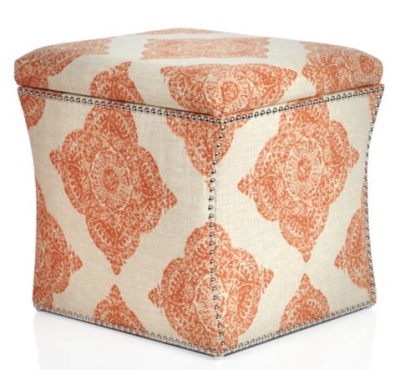 Z Gallerie has a storage ottoman in five different prints; this one, called Mani Terracotta, was my favorite. 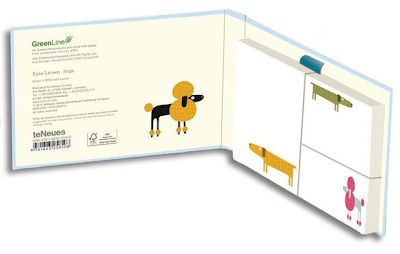 You can order a fabric sample to help ensure the piece will really work in your room. 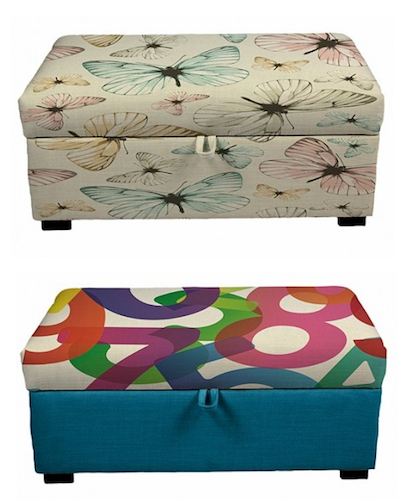 The Stockwell storage ottoman from Chair Candy comes in eight different patterns — or you could design your own. Chair Candy is based in Australia. 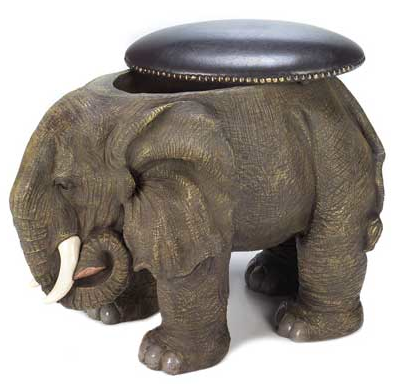 And finally, for the pure silliness of it, I have to share the elephant storage ottoman.